Shazia Khushak Sindhi Balochi Folk Music Singer. She is most popular Artist of Sindh. She has sung in different languages. Shazia Khushak is great Sindhi Lok Music Artist of Balochistan and Sindh and also she is very famous in all over Pakistan. Shazia Khushak has sung lot of songs and she performed in 45 countries of the world. She is very popular due to his stylish singing, he sung Pop Music with Dhol. She is very popular in Radio Pakistan and Pakistan Television. Shazia sung lot of Balochi and Sindhi Songs. Shazia Khushak has sung most popular super hit songs, specially her most popular song on Dhol in Balochi style "Dane Pe Dana", was very famous in all over Pakistan and also in abroad. She sung in KTN Sindhi Channel and other Channels also. I have selected below most popular and Super Hit Sindhi and Balochi Folk Music of Shazia Khushak. Shazia Khushak was born at Jamshoro Sindh. She created good name in Sindh Music. She performed a show in 1992 as per advice of her husband and he encouraged and she performed well. Shazia Khushak emerged as a singer of two prominent dialects Sindhi and Balochi. 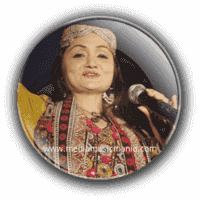 She is great Sindhi and Balochi Music Folk Singer, she is fan of hit songs about Marvi and poetry of renowned poets of Sindh "Hazrat Shah Abdul Latif Bhittai R.A" and others.